Our church is s ponsoring a once a month Youth/Children Luncheon on the second (or third) Sunday of the month. The first luncheon will be on December 11. 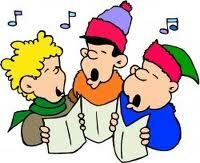 The Youth/Children are encouraged to participate in the Christmas caroling that day also following the luncheon. We need volunteers to sponsor a monthly meal. You may want to team up with others in your Sunday School class to help in this ministry event. Sign-up sheets will be available.